Our state of the art reformers and studio equipment are ideal for building and toning muscles as well increasing stability through the joints. Develop your body awareness, improve your posture and increase your flexibility. ​Our group Pilates classes will help modify your shape while enhancing your strength, posture and mobility. ​Individually tailored exercise programs run by our physiotherapists for a stronger, quicker recovery. Exercise in small groups or book your one-on-one training. Exercise classes which help to strengthen the pelvic muscles, improve circulation and increase overall comfort during pregnancy. Enhance postnatal recovery with abdominal and pelvic floor toning. ​Ready to start your Pilates journey? Call 02 9567 9452 to book a session today. If you're looking for a healthy way to exercise with like-minded locals, you'll love our Pilates classes. 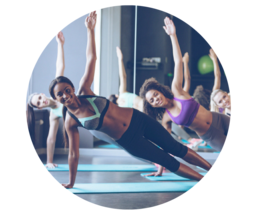 Joining a Pilates class may be what you need if you want to enhance your core strength, develop body awareness, improve your posture and increase your flexibility. By focusing on contemporary, intelligent, biomechanically-efficient exercises that provide maximum results without the risk of injury, Pilates can benefit everyone. Whether you are working with a serious injury (back, knee, hip, spinal injuries), are a senior with balance issues and pain, an over-trained weekend warrior, a pre or postnatal woman or a teenage athlete, we have experience working expertly with a variety of needs. ​Pilates is designed to safely transform your body. The integration of these six Pilates principles is fundamental to the essence of the Pilates workout. Each movement in every exercise is performed with complete control, precision and concentration to achieve maximum results. The Pilates method emphasizes the quality of movement over quantity of repetitions. For this reason, there is no need to do more than 5-10 repetitions of each exercise in the repertoire. In order to execute the movements correctly, however, one must remain focused on firing the muscles of the core. A mental focus on the muscles of the torso (abs, pelvic girdle, lower back & gluteals) enhances the development of a strong center and allows the body to move with efficiency and balance. All Pilates movements emanate from the center of the body and flow outward to the extremities. Specific breathing patterns help to encourage deeper muscle recruitment while aiding in the flow of the movement. "Pilates is complete coordination of body, mind and spirit"